The first of six designs that start with a block that looks like the drunkard's path. 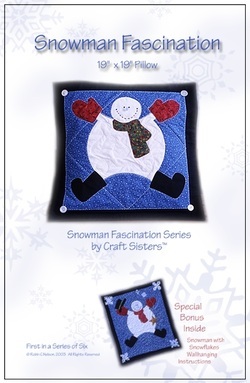 The pieced block forms the snowmen bodies in a much easier way than the traditional block. No curved seams make it simple and faster to complete. 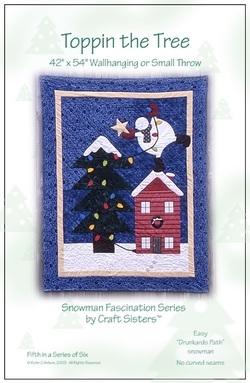 Pattern includes all instructions and the gingerman applique which can also be made into a stuffed ornament. 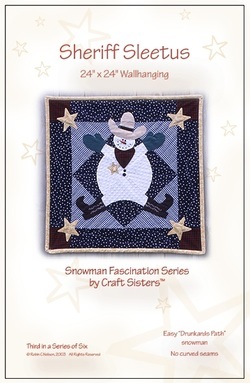 Three snowmen pop from a snowy night sky in this playful wall quilt. (no curved seams). Applique the heads, boots, mittens and hat. Looks good in a small space. Sheriff Sleetus has his badge and is ready to round up the snowflake gang. Piece the body with an easy drunkard's path block (no curved seams). Add appliques for a western winter wall quilt or it could also be made into a pillow. 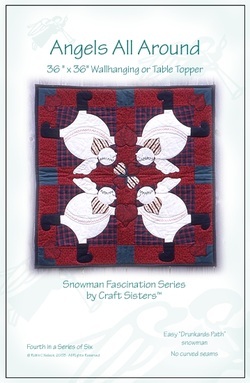 Snow angels and hearts make a charming wall quilt or table topper. Make easy drunkard's path blocks for the snowmen bodies (no curved seams). 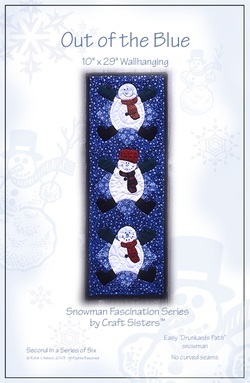 Applique the snowman's accessories by hand or machine and finish with some simple embroidery. Snow Bob has the tree lights plugged in and just needs to place the star at the top of the tree. Piece together 2 easy sections and add the appliques as the background is formed. Finish with as much embellishment as you wish. Hey baseball fans. 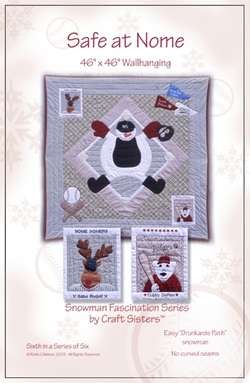 Here's a wall hanging or throw featuring the North Pole League. Piece an easy drunkard's path block (no curved seams) and add some applique to form Squint the umpire's body. Piece the baseball field background and add the remaining appliques including Babe Rudolph and Cubby DePaw baseball cards. All templates included. An easy to piece broken dishes block center and four checkerboards anchor the corners of this buzzin' garden quilt. Flowers and bees are appliqued, wings of the bees are dimensional. The bee flight paths are fun and easy to quilt. Imagine your bees flitting flower to flower from one part of the garden to another. Quilt in their flight paths with a larger running stitch in black or a contrasting color. Two full size flight path examples are included if you need help with this along with all templates and instructions.